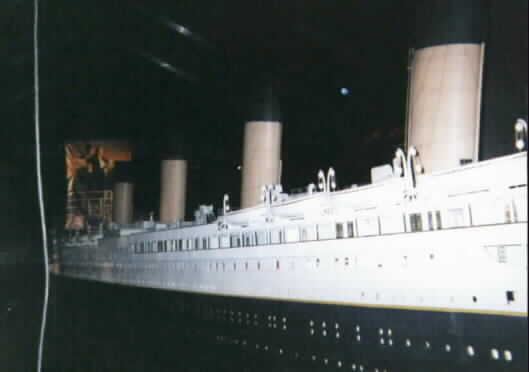 The main thing that takes up the most room at the exhibit is the Titanic Model used for the movie. IT'S HUGE!! It's the one used for sinking shots and all the other real needs for a model for this movie. 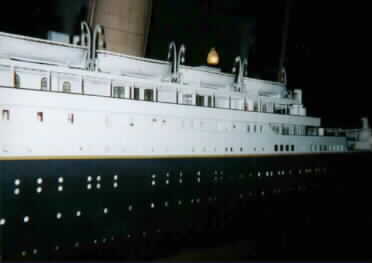 Like I said, the Titanic model takes up a large portion of the exhibit. Hopefully above gives you a chance to see how big the model really is(like the boat itself, right?). The other picture shows the detail of the model, down to curtains and fake stained glass. It's incredible. 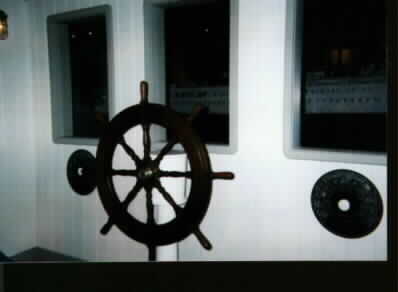 The wheelhouse replica above is one of the few places you can actually touch the props. Everything else mostly is behind ropes and cases. You can actually go stand in this little set, and hold onto the wheel.